Future generations will no doubt stare back in wonder at our time. To say that the Trump administration has changed the face of the United States would be an understatement. The damage that he has done, and continues to do, is something that will be studied for decades. However, it's not policy that concerns me. What I find to be the most destructive facet of Trumpism is what it's done to our bearings within the world of facts. It's nothing short of astounding. While Dostoevsky famously wrote, “If God does not exist, everything is permitted,” the Trump era has created an equally profound and disorienting sense of vertigo with regards to knowledge. For us, it seems, there is a feeling that if Donald Trump is president, everything is believable. It doesn't matter how conspicuously absurd the news is, you will inevitably find people who believe it. In fact, even rational people, people who follow the news and are well-read and have studied politics and history, may be lured into the sense that something utterly fantastical is possible. As America goes to bed tonight, all of the very serious people who are paid very well to be the thought leaders of the two dominant political parties of the world's sole super power are arguing about a piece of satire that claims that the President of the United States spends whatever time he's not mowing down cheeseburgers and drowning his sorrows with a bottomless cocktail of Fox News, vitriol, and Diet Coke or blasting off tweets that may either continue a feud with a C-list celebrity or destabilize an entire region ordering previously recorded images of gorillas to attack each other. You have to ask yourself at this point: Is this real? Are we living in reality or is this all just a simulation created to appease the American Caligula? (Random fact: Caligula is Latin for “little boots.”) Is it possible that Trumpworld is actually just a virtual world that was created by some evil genius who plugged Trump in and allowed him whatever his heart desired, thereby meaning we're just strings of code under the illusion of consciousness? This may seem like an absurd question, but I am posing it at a time when Americans are expressing uncertainty about everything from evolution and climate change to whether or not the world is flat. 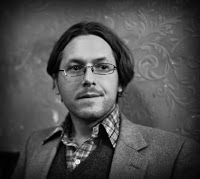 This is a time when conspiracy theories have oozed from the furthest fringes of the internet and onto the History Channel and the front page of formerly reputable publications, fueled in part by provocateurs who see no harm in exploiting rubes to make a few bucks and Russian bots hoping to foment political discord via tweet. Yes, if Donald Trump is president, everything is believable, but you would think that there would be a limit. Our culture has become mired in fictions and absurdities, and anyone who immerses themselves in it long enough can't help but become mired in a perpetual state of outrage. At best, they end up raising increasingly captious arguments that would seem petty to a kindergarten teacher; at worst, their sense of trust becomes so pliable and tribalistic that they only believe what reinforces their existing opinion and reject everything else. Such an environment begins to take a toll on you. Every day there is a new monstrous thing that comes creeping out of the sewer of the internet or the White House, and eventually you have to make the decision between becoming wholly absorbed in it or cutting yourself off by finding something else to occupy your time. For a lot of people, this outlet is Netflix. It's understandable. There's a lot of good television being produced right now. For me, however, it has become playing music—on top of writing actual fiction. And I feel that I'm not alone, especially when I play out with my band, High Pony, at a place like Brooklyn's Alphaville (140 Wilson Avenue, Bushwick). I would like to say that Alphaville holds a special place in my heart, but I think that such a statement would be premature. I've only played there twice, and it's far enough away from my apartment that it's not a place that I frequent with any regularity. However, the last time I played there I sensed something special. Even though we arrived to play on a Thursday night in the direct aftermath of a blizzard, and even though every other venue this side of the East River had canceled their shows for the night because there was an understandable concern that owners would lose money from a lack of attendance, Alphaville not only stayed open—they managed to attract a sizable crowd. In fact, I've played Friday nights in places with better access to trains and without a foot of snow on the ground and had a far worse turnout. This tells you that the venue itself has a draw, which is important to any community of musicians. It's because it allows for a space where an event is possible. True, it's not a revolutionary event in the sense of Badiou or Deleuze, but it's something similar. This is where you come to learn about new bands, even if you don't know anyone on the bill. It's where a musical community begins to form a spontaneous identity, which is beginning to happen. (Think of the New York City punk scene in the 1970s and how it had its roots connected to places like Max's Kansas City and CBGB). 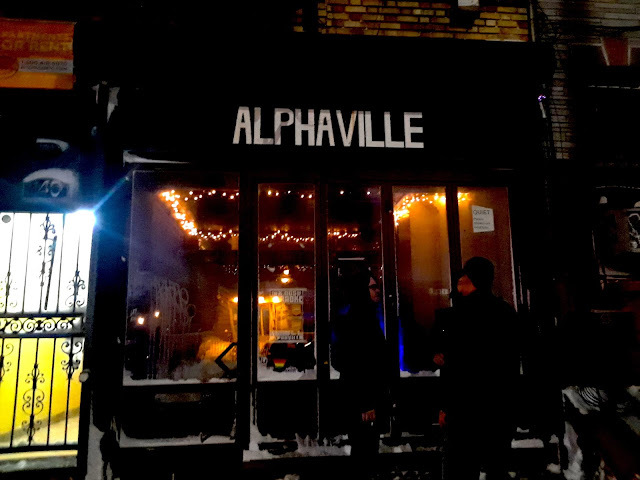 While it would be wrong to say that Alphaville is uniquely capable of being a place where a new breed of rock can spawn, it is really one of a handful of venues that has any real gravitas in Brooklyn now that Shea Stadium has closed. Such places are necessary if a musical community is to flourish, and, perhaps more importantly, they are absolutely necessary for people who need to get the hell out of Trumpworld, if only for a night. I believe that people can escape it momentarily without losing sight of the larger and more difficult projects that lay before us. After all, if Donald Trump is president, everything is believable.